Know exactly what machine you need? Fill out our RFQ form to get in touch. 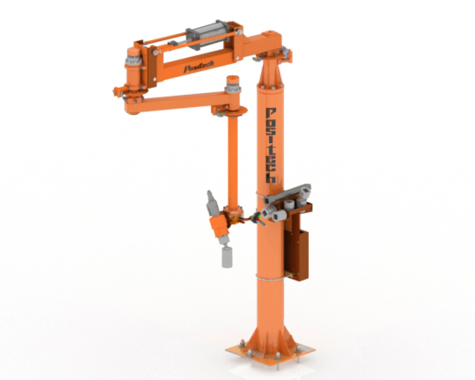 Positech Corporation, the leading manufacturer of material handling equipment in North America, recently launched the redesign of its ReactionArm® industrial manipulator, under the Positech brand name. The ReactionArm® Manipulator is a pneumatic torque reaction arm that absorbs shock, torsional forces and impact forces from power tools; reducing carpal tunnel injury and cumulative trauma disorders. Cumulative trauma injuries cost the United States billions each year. The ReactionArm® reduces injuries to workers’ wrists, arms and upper bodies by absorbing the shock of an attached power tool, torque gun or nutrunner. The new design offers lift capacities of up to 500 pounds (226 kg) along with a torque capacity of up to 2, 212 foot pounds (3,000 N-m). The new design also lowers balance forces, giving the operator a float feel when moving throughout the work cell. The new middle joint leveling feature allows the arm to stay in place once the operator positions it, no second arm drift. The ReactionArm® is a low maintenance industrial manipulator that does not require an air lubricator and is pneumatically operated; only requiring 90 psi of clean dry air. The ReactionArm® can be mounted overhead, on a trolley, pedestal mounted, wall mounted or mounted on a mobile/portable base. The floor mounted pedestal is provided with concrete anchor bolts, mounting hardware and leveling jacks for ease of installation (no grout required). The Positech ReactionArm® has many available options including vertical axis brakes, pistol grip or ergonomic twist grip controls and Remote Start Circuitry to ensure breaks are engaged prior to vertical torque. It comes standard with a pilot operated lock valve, minimum lift circuitry and parallel linkage to support loads beyond end-of-arm. Standard and custom tool holders, operator controls and specialized circuitry are available to meet customer requirements. Positech offers full turn-key or integration of customer supplied torque equipment. Work tools and stands that are incorporated into the work cell can also be provided. For more information regarding the Positech ReactionArm® or other ergonomic lift assist products, contact Positech Corporation at 800-831-6026 or sales@positech.com. Positech designs and builds the industry’s largest selection of custom and pre-engineered industrial manipulators and lift assists. Sign up for our newsletter distribution list to make sure you’re on top of the latest news and happenings at Positech! 191 N. Rush Lake Rd. Copyright © 2018 Positech Corporation. All rights reserved.